In large bowl, mix all Meatball ingredients except oil until well combined. Roll mixture into small meatballs (about size of walnut). In 10- to 12-inch skillet, heat oil over medium heat. Brown meatballs (in batches, if necessary) on all sides just until browned (they don’t need to be cooked through). Transfer meatballs to large plate. Stir flour, paprika, 1/2 teaspoon salt and 1/8 teaspoon pepper into drippings in skillet to make a roux. Add boiling water and sour cream; stir until well combined. Return meatballs to skillet. Reduce heat to medium-low; cook 15 to 20 minutes, turning meatballs occasionally, until meatballs are thoroughly cooked and no longer pink in center, and gravy is thickened. 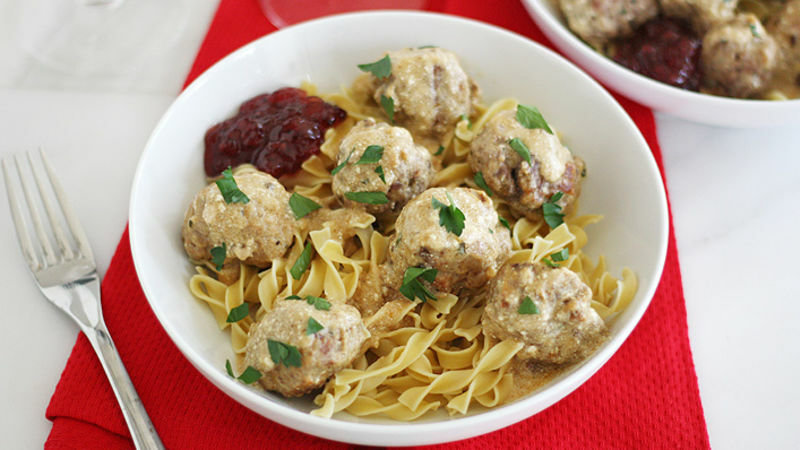 Serve meatballs with egg noodles and gravy; sprinkle with parsley. Serve with lingonberry jam on the side. To freeze this dish, divide meatballs and gravy between two airtight food-storage containers. Freeze up to 3 months. Thaw in refrigerator overnight, then reheat, thinning sauce with water if necessary. Swap lingonberry jam for red currant jam, if desired.